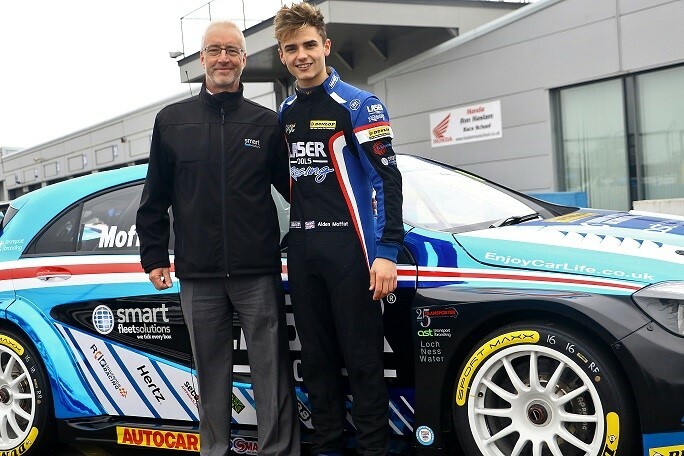 Smart Fleet Solutions – the leading provider of technical solutions to the UK’s major fleet operators and manufacturers – has today announced that it will be sponsoring one of the most exciting drivers lining up on the grid for the 2017 Dunlop MSA British Touring Car Championship (BTCC). Aiden Moffat, who made history as the youngest ever BTCC driver during his first season in 2014, will once again be contesting for the Championship in his striking Laser Tools Racing Mercedes A-Class. Still just 20-years-old, Heriot Watt University student Aiden achieved three top-10 finishes last season, including a best-ever second place to make it onto the podium following the final race of the 2016 campaign at Brands Hatch. For Smart Fleet Solutions, which helps fleet owners and operators maximise the value of their vehicles by offering end-to-end de-fleeting services including inspections, refurbishment and repairs, the sponsorship was a perfect fit. This year’s Championship starts at Brands Hatch on 1 April, with subsequent rounds taking place at the UK’s most iconic race tracks including Donington Park and Silverstone, before heading back to Brands Hatch for the season finale at the end of September. Smart Fleet Solutions operates a network of state-of-the-art technical centres in Wiltshire, Nottinghamshire, Staffordshire and Scotland and employs more than 400 people across the UK.